Tell Your Friend about Your Berylline Scooter and get additional $100 discount towards your purchase price!!! Thank you for Pre-Order, or, being interested in our new and exclusive Berylline F2A Hybrid Scooter! We are very excited to welcome you to join our Exclusive 500 Club! To compliment your Pre-Order, we’d like to offer you an additional $100 discount if you refer a family member or friend to Pre-Order one of our hybrid scooters! 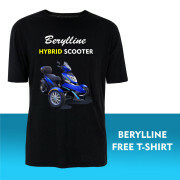 It is fine if you have not Pre-Ordered yet, you can still tell a family member or friend, and if one of them Pre-Order our hybrid scooter, we will send you a free Berylline T-shirt! And, of course, when you decide to Pre-Order, we will give you $100 credit in addition to our current promotional program towards to your final purchase price. Our number one mission as a company is to provide as many people as possible with a fun, safe, economical and enjoyable means of transportation, whether commuting in local communities or exploring across the country. Your recommendation and positive word of mouth would be much appreciated and rewarded with this limited time referral price reduction. Please contact me directly at mdresser@beryllineusa.com if you have any interested future buyers who wants to join the Berylline Hybrid Scooter movement! 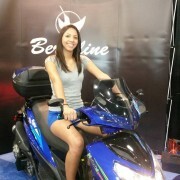 Please come visit us at the Progressive International Motorcycle Show in Miami, Florida from January 16-18. 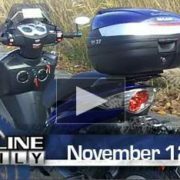 View the pre-production bike and talk with our representatives to see how the all-new Berylline F2A Hybrid Scooter can benefit you! 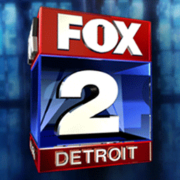 Berylline was featured yesterday on the 5PM Fox 2 Detroit newscast!